What is the Identification section? Identification is a way to remember and pre-fill data that you need for an inspection. The identification of an inspection is done by using a unique 'key' in the identification section. To enable this functionality of attaching inspection data to a particular asset/occurrence, we have introduced the concept of Identification. The identification section has single/multiple items pertaining to the 'topic of inspection'/'key identifier'. Like in case of a vehicle this could be the vehicle's registration number (unique number). If you have defined a key and an inspector filled an inspection using the registration number, the data associated (filled) in this inspection can be seen during the next inspection - whether it is by the same inspector or a different inspector. This can be enabled per question in the editor. If you have defined a key and an inspector filled an inspection using the same key, the next inspector will not have to re-fill all the other data in the identification section again (this very useful for periodic inspections). Quickly find your inspections as the key is visible in the overview tabs in the Capptions app. How to create the Identification Key and Identification items ? The ability to create Identification items lies with the Template creator. 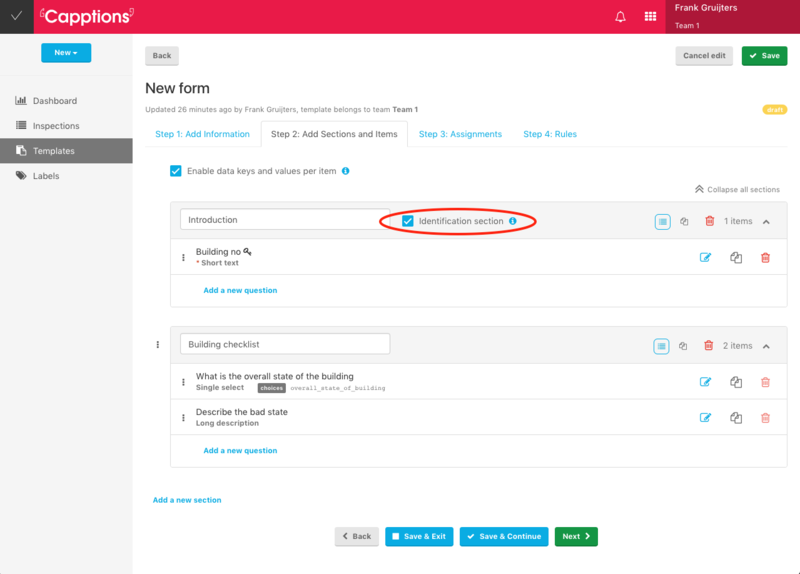 Login to your 'Manage Inspections' dashboard and start creating a new template. In the Step 1, you will see the option to create an identification section (see below). Click on the checkbox to proceed. The first question of the first section is the key. This is something you cannot change. In the above screenshot, the 'Building no' is the key identifier of the inspection to be conducted. This number has more details attached to it as well like the Vehicle Type and Vehicle condition. You can choose your own key and also whether you want to make it mandatory to fill all/some of these items. There can only be one key defined and the key by definition is a required item.